The piled up spill articles since the 12th. This. This seriously makes my brain scream. So I’m going to start you with this link. It has an awesome video clip from Rachel Maddow. I think one major thing we can take away from this is to pay attention to where we fill up our tanks and boycott Exxon. If the government will do little more than a slap on the wrist we can at least take a chunk of their profits. Yeah. let’s power wash the oil off the pavement which is made of crude oils already and let it infect the earth some more. Good plan. Yeah, let’s put some paper towels on it.” This isn’t your kitchen! Be productive and FIX it! “Despite spilling tens, if not hundreds of thousands of gallons of oil and chemicals into an Arkansas neighborhood, thanks to a loophole in a law from 1980, ExxonMobil will not be paying into a federal oil spill cleanup fund because the oil they spilled is not the right type of oil. It is a twisted example of the legal technicalities and lax regulations that all too often favor oil companies, but a coalition of environmental groups are working to close the loophole. According to Congress and the IRS, diluted bitumen or dilbit, which is the type of oil that has spilled in Arkansas, is not classified as oil and companies shipping it are not required to pay an 8-cents-per-barrel excise tax into the federal Oil Spill Liability Trust Fund, as companies shipping conventional oil do. According to the oil industry, tar sands oil is oil when the oil industry needs oil spill cleanup funds, but it isn’t oil when it comes to paying for that cleanup fund. The industry also opposes changes to how tar sands oil pipelines are regulated. So again, they consider tar sands oil just like conventional oil when it comes to their pipelines, but not when it comes to cleaning the spills those pipelines create. But hey! 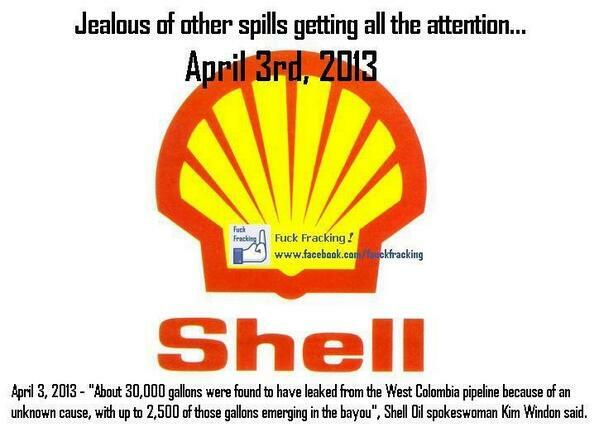 On the bright side Exxon is cleaning up their mess! “Company workers wearing logoed shirts roam throughout the town. Local police guard the entrance to the neighborhood where the spill happened. On Starlite Road, where oil flowed down the street last week, workers vacuum up oil in yards and steam-wash pavement. The oil company has also taken over wildlife rescue from a local organization; independent rescuers report that they are being forced to leave private property by ExxonMobil enforcers. (Casualties so far include oil-covered ducks, snakes, and nutria.) Reporters who accompanied Arkansas Attorney General Dustin McDaniel on a tour of the spill on Wednesday were asked to leave by Exxon representatives. Even the state Department of Environmental Quality refers reporters to the Exxon downstream media line for information. Lisa Song at Inside Climate News was one of those journalists threatened with arrest after she went to the command center for the cleanup operation in an attempt to reach an Environmental Protection Agency and the Department of Transportation official for an interview. Elsewhere, “an activist indy news team” duo called JNL, has been using Ustream and Twitter to report from Mayflower and interview local residents. Yesterday, they were detained by police and forced to leave private property where they were reporting from, despite having permission to be there.” Follow the link for videos. So if one follows the mind set of the Zeitgeist movies (and I’m pretty sure I am right now since I watched Addendum yesterday) This was all on purpose. What better way to keep resources limited than by making them less viable? People not feeling well? That’s just a bonus! Think of the money they’ll have to spend to combat the symptoms they’ve just acquired. Then they can continue to charge what they have been if not raise the prices. Keeping themselves nice and cozy.